My Take on it – After having watched the first movie of this series, the kids insisted that we watch the second installment. 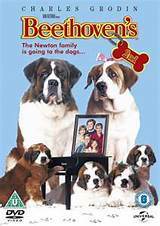 Interestingly enough as Beethoven and his girlfriend Missy were dealing with their problems, my wife was going thru the early stages of labor pains while the whole family enjoyed this movie. This movie had its moments but it still wasn’t as good as the original. Regardless, it was still an enjoyable film to watch (even during labor ) 🙂 for the whole family. Love this movie’s love theme song by Dolly Parton and James Ingram – The Day I Fall in Love. It was nominated for an Oscar, but list to the Springsteen song Philadelphia. Bottom Line – Not as fresh and original as the first but still done well. Fun for the whole family. Great theme love song by Dolly Parton and James ingram that was nominated for an Oscar for Best Song.